We hope you are all enjoying the user-submitted editorials written by our very own forum members and site readers! 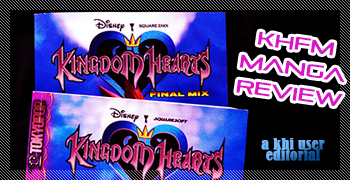 Today we have Rydgea reviewing the brand new KINGDOM HEARTS FINAL MIX manga that have been retranslated and published by Yen Press! Hey Kingdom Hearrs fans, Rydgea here! Thought I'd share a briefing on my initial experience with the subject matter. I haven't read any manga in a while, and this was clearly an opportune time to revisit Shiro Amano's first frolic with our heroes and, as I've never purchased comics from them before, get a feel for how Yen Press operates. With a refreshing trip down memory lane in store and more Kingdom Hearts material to satiate my fandom until Kingdom Hearts HD 1.5 ReMIX arrives, I leapt at the opportunity to pick this up and share a few of my impressions. Take your time. Don't be afraid. The door is still shut. Let me preface this by saying I'm not sure how true to the original printing format this constructed KHFM is to Japan's release, and since Tokyopop's run is the only standard I have to go by it will be used for this comparison. Also, just to emphasize this is a comparison of technicalities, for the sake of prospective buyers of this new edition, and it is not a review of the plot, characters, artwork, etc. It's pretty nit-picky, and if I ever had any bias it was put in check, as I haven't read the Tokyopop edition of Kingdom Hearts since '06 or '07. Note that I've only read the first four chapters of the Yen Press run, and thumbed through the book for other details to compare. Also note, the photos represented were taken in a naturally lit area with no flash, reduced in size and cropped only to compensate the forums, however, no manipulation was used. So with that in mind, let's get started. Let's start with what's right in front of us. Yen Press's KHFM and Tokyopop's KH are very close to the same height and width, Tokyopop's being just millimeters shy of equal proportion. So, for example, let's say that you had previously purchased volumes one and two of the Tokyopop edition and only needed the second KHFM omnibus, they would look nice standing side by side or stacked on top of eachother. Granted the spines put a damper on it looking uniform, but for those not OCD, this is perhaps more than coincidence. There's a trim for the header and footer on every page in Yen Press's printing, and it's a little annoying if not plain unnecessary. I know for novels this is standard, but with comic books I want to see the art, and here the indentions just seems to be taking up space. At the top it's coupled with a checkerboard pattern, which is a little distracting. I'm sure these minute intricacies will eventually be overlooked once the eye is trained and you're engrossed in the read, but I haven't reached that point yet. Some of the page dividers which usually showcase more meticulous imagery of Amano's choosing (the very detailed, shaded items like a pair of goggles, a paopu fruit, a magic lamp, etc.) had randomly picked art from previous panels that had no effects to make it look seamlessly implemented like the rest. In fact, some were cut off and one had a sound effect attached to it. I gagged. I would have preferred a blank page. Looking from one edition to the next, I noticed Tokyopop ironically had larger but cropped artwork. As stated earlier I have no way of telling what the aspect ratio for the Japanese releases were, but Yen Press gave us what I can only hope was the whole picture, even if it was condensed. It's always upsetting to me when the artists work is cut short, but since I was doubting Tokyopop for the scaling, I assumed they had compressed the picture as well when I came across, even more surprisingly, some distortion issues. Yes, either Tokyopop squashed the artwork in their run, or Yen Press stretched it out in theirs. The paper quality, texture, and bond are fairly similar in both versions, and I didn't find any transparency. Both were comfortable to the touch, but Tokyopop's pages looked yellowed next to Yen Press's clean, white sheets and the weight of the omnibus nestled smoothly in my hands. 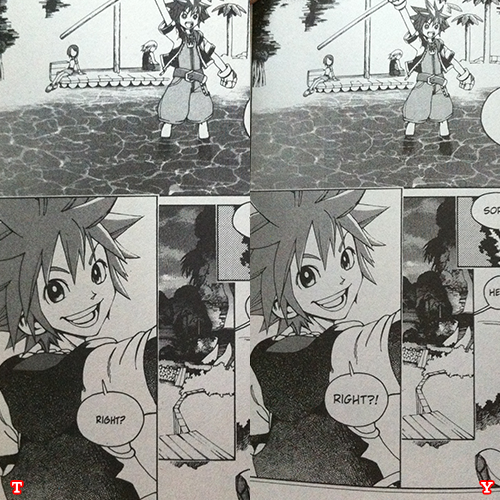 I'm not sure what happened but after the first set of color pages, the brightness and contrast reverses noticeably. This is a good thing for Yen Press because everything becomes clearer and details more vivid albeit grain and ribbing from printing becomes slightly more pronounced. Tokyopop's press seemed to blend the toner better. While it's still an improvement for Yen Press, this changes again in volume two where everything is drastically darker and the some art is washed out in the void. Ansem, SoD is swallowed by the darkness. I've included several labeled comparisons in this article to give you a reference for some of the things I mention. 2) Y: I noticed a lot of extra vowels and elipses, and I'm wondering how literal a translation those are. 3) Y: Did they just add a sound effect where there was none? 4) T: Kairi's head looks squashed here. Like Stewie or Arnold, she has the football-head thing going on. 5) T: There's a manilla tint to the paper. In the Yen Press editions the text itself is generally nicer to read, the fonts looking more classy, and the kerning spaces the letters out more, making it easier to read. I have to mention that it does read from left to right, so those expecting an authentic manga experience might feel snubbed once again. T: "This is Riku's and my secret place!" Y: "This is our secret place - just me and Riku!" T: "You know nothing. You understand nothing." Y: "Yes...You do not yet know anything-"
T: "People loved the light, and eventually began fighting over it." Y: "Everyone loved the light. Then people began to fight over it. They wanted to keep it for themselves." 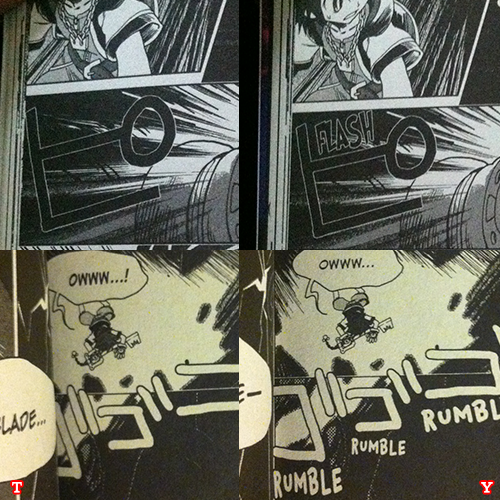 The Japanese sound effects retained in the Tokyopop edition are replaced with English sound effects if possible, but sometimes there were limitations where they failed to remove them and so you have double the sound effects taking over the page and it looks really cluttered and, again, inconsistent. My personal preference is to preserve the original presentation and have a sound effects glossary at the back, but it is convenient for those who can't be bothered. Ya gotta look funny, like us! With Final Mix, you get the ever adorable Kingdom Bites comic strips, plus a new bonus episode and a special short not released in the Tokyopop localization! But there is a rough sketch gallery found in the Tokyopop version not present in this one. Since the first omnibus had a color page which was the front and back cover of volume two, I expected the second to have a color page for volume three. To be honest, I was suprised by the lack of color pages and the general treatment of the color pages in this newest compilation. Some of them looked extremely muddy, and it's a real shame. In conclusion, it's Kingdom Hearts. What else can I say? I know I'll have fun reading it, and I can't wait to finish this new set in its entirety and let it fully sink in. There are definitely enjoyable aspects provided by both publishers, and at this point in time, it's too early for me to choose a quintessential edition. I do hope the other Kingdom Hearts books are put to bed with consistent care and plenty of frills! 1) T: Again, I see some sort of warping, widening Sora's body. 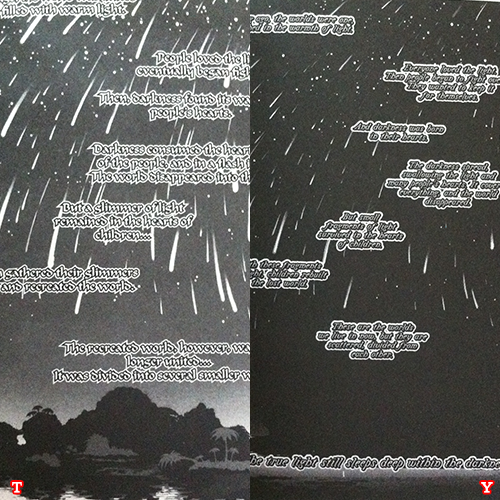 2) T: While still decipherable, the text is not as clear as Yen Press's. 3) Y: You get an abundance of exclamation points or vowels, which edition holds true? 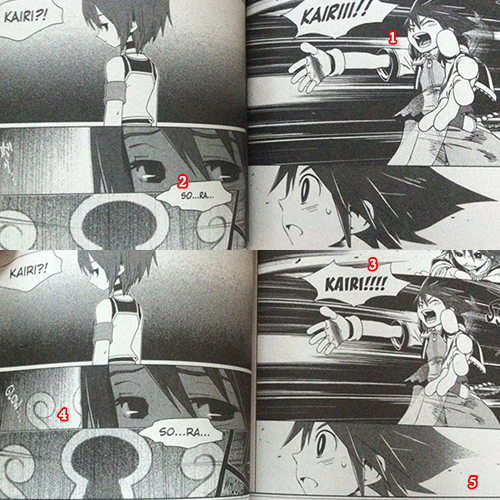 4) Y: Did they take the liberty of copying and pasting the keyhole behind Kairi? 5) Y: Sora's hair fades into oblivion. Added for dramatic effect or not, I want to know if this is how it was overseas. 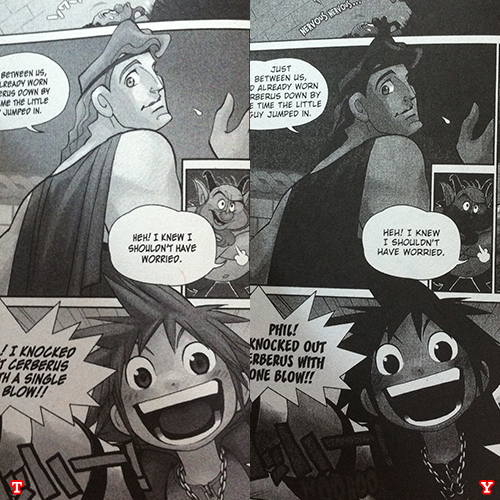 With that what are your thoughts on the Kingdom Hearts Final Mix manga? Did you enjoy it? What did you think of the changes? What are your expectations for the rest of Yen Press's scheduled lineup? Very informative editorial Rydgea! I've been wondering for a while what dramatic changes there were. You've spotted and explained the differences very clearly and detailed. I say probably because I don't have the Japanese versions so I wouldn't be able to confirm. Also TP totes removed that sound effect rofl. In my own opinion, I love the little narrative changes in the translations. It makes the manga less copy + paste of the game script and allows it to be its own thing like Amano set out to do. Also overall I enjoyed YP's translation over TPs. TPs seemed very uninspired, but YP was able to get a lot of the characterization of every character on mark. Sadly he kind of is. It's like Seeker of Darkness Into Darkness. I laugh every time I get to the pages with SoD because he's so DARK. Don't let that deter you. The overall thing is extremely enjoyable, especially with the bonus chapters. Yeah, sod is unfortunate. I also like to see the original artwork as it was meant to be, sans any distractions. Though when it comes to translations, id prefer for sound effects to be replaces, and dialogue that sounds natural to me, even if that means rearranging the words. Though keeping the meaning of the original dialogue is paramount. You trade one thing for another with these different releases. I was a bit dissappointed we didn't have full colour pages for the chapter beginnings. Based on the pages above, the translations seem quite similar, but I'll for my copy to see for myself. Agreed, I don't think literal translations are nesscessarily the way to go as the meaning behind the words can often be lost, especially with puns. It is the thought that should be convered, not the exact words. Sadly a lot of official translations seem to keep lot of Japanese terms in, which can alienate new readers. They are similar, but there are some things that make the narrative better. The part where the villains are first shown as shadows, you can tell who is who by their lines when before it was kind of just people talking is one example. Yeah here's a comparison between the two. Hook: That darn cat... It needs to shut its big mouth! We should have finished him off when he turned down our offer. Ursula: Too late for that. Malificent: There's no need to rush. It will take him ages to find the others. Besides... The pieces into place in our favor. Hook: Acursed Feline... It needs to shut it big mouth. We should have sent him to Davy Jones's locker as soon as he refused to join us. Ursula: Ha! Too late for that. Malificent: There's no need to rush matters. It will take him ages to find the others. Besides... The pawns are all falling into our hands, one by one. NICE JOB RYDGEA! Very informative editorial, I personally like the Tokyopop release, since they keep it like it was in the original one, with the japanese sound effects and ink-ing. But I have a question, what does the Final Mix manga have that the original manga didn't? I made an account just to comment on this... I study Japanese and picked up all volumes of the KH manga when I was last in Japan. I read the first volume of Final Mix very very frequently as a sort of "progress update" every couple of months. I can't read everything in it but I can read quite a lot of it, so I thought I'd chime in on some of the comparison shots. I don't have either English version, so I can't really compare between the two in terms of aspect ratio. I will say that the Japanese version has a border as well, along with a small checker pattern. Don't know if it's the same one or not. First up (Kairi in cave). The extra vowels and ellipses are definitely present in the Japanese version. As soon as you mentioned the "This is Riku's and my secret place!" I knew exactly what line your were talking about. That line is a pain. Neither line is more correct than the other, really. Personally, I would probably have done something like "This is the secret place for only Riku and me," or something. For some of the other lines, I can't quite find them in my copy and even if I could I'm not sure if I could read them quite right. I think I found the Ansem one and it definitely has a "nothing yet" component instead of just a "you know nothing." 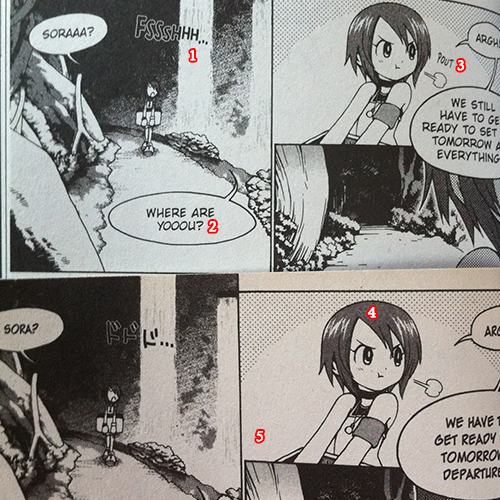 When Sora and Kairi meet in the cave -- Yen Press is more accurate regarding the whole exclamation points/vowels thing. Japanese Sora shouts "Kairi!!!!" The Keyhole is also present in Japanese. To be honest I'm not really sure why Tokyopop seems to have misplaced it. Sora's hair also fades as it does in the newer edition. It's important to remember, of course, that translation Japanese to English is particularly hard and that in a lot of these cases no one translation is better than the other. Japanese is a really high context language, and it really depends on the situation how you could translate something. However, I'm inclined to say that the Yen Press edition seems to have followed more closely along with what the original Japanese version was doing. Thanks for the insight 7Deadly$ins, that is really interesting. Are some of the pages in the Japanese edition also noticeably darker? Also nice job on the review Rydgea. But I'm a bit intrigued what the bonus episode is about. Does it fit into the story arc and how many pages were added in total? Hm. 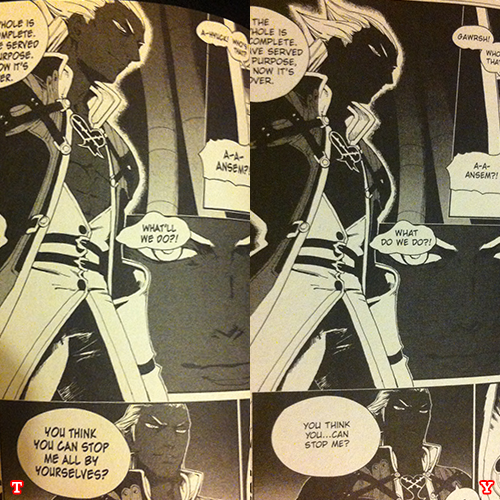 My copies seem darker than the TP version, but not as ridiculously dark (especially on Ansem) as the YP copy. It could be a difference in print runs, scan quality, or something in between. Rydgea already explained they have additional bonus chapters. You're probably right! I think the embellishing is nice, but I always speculate when artists' visions get "upgraded". If things like the keyhole behind Kairi were added in the Japanese Final Mix, it's justified that we see it here. Differentiating between KH & FM is one thing but differentiating between localizations is another. Thanks for putting that into context. Though when it comes to translations, id prefer for sound effects to be replaces, and dialogue that sounds natural to me, even if that means rearranging the words. I think if it had been solely English sound effects, they might not have even popped out until I did a comparison, but to leave Japanese sound effects over a pitch black panel with smaller English ones next to it just seemed like an egregious error to me. Though keeping the meaning of the original dialogue is paramount. It's disappointing for me considering so much manga (that I'm not interested in) is tailored in a format of my dreams, but when I finally get my hands on something like this it was absent the bells and whistles. I'd say the issue with the color pages was my main let down with this release, honestly. Sadly a lot of official translations seem to keep lot of Japanese terms in, which can alienate new readers. I think a lot of people assume that, but if I'm genuine with myself, I know I'm willing to expand my mind just for the sake of knowing these references, and, hypothetically, if I were a translator I wouldn't want to cheapen the experience of the entire audience just because someone doesn't understand something. Btw, I just mentioned this in the article for perspective, but I can't pick up on any evidence where this actually happened. Yes! These are some good examples. I've been continuing reading both side by side (I'll probably complete the comparison read, because this stuff is very interesting to me), and you can see where Yen Press's attention to detail really shines in their telling. Another similar example, Cid now reads like he did in FFVII, and it's damn fabulous. But I have a question, what does the Final Mix manga have that the original manga didn't? Wow! Thanks for the clarification 7Deadly$ins (I almost called you 7DeadlyZins, bc that is my favorite wine~), and welcome to the forums! It's good to have proof backing up the localizations faithfulness. Tokyopop's not at fault there, because they translated the original KH manga, not the FM version. Still, questions arose because of the differences. Appreciate the investigation on those other issues as well. Ty! The bonus episode takes place between the Agrabah arc. As to why it is planted here, I'm not sure, I haven't read that far yet. I'm going to take Master Spockanort's word that the bonus content transitions fluidly. I hope you do continue these comparisons, I never read the Tokyopop version so it's interesting to see how it's changed. I'm working on a blog comparing the Chuang Yi (Singapore release) and Viz/Tokyopop releases of various manga titles in terms of artwork quality and translation. Ooh, very nice detailed look at both versions of the manga. Nicely done, Rydgea! I really like how much attention to detail you paid with this, and I'd love to see more comparisons like this with future Yen [strike]Sid[/strike] Press releases that we also got Tokyopop versions of, if not from Rydgea then from someone else. It's quite useful information, to be honest. Have you seen SailorHell's blog comparing Kodansha's reprint of Sailor Moon with the previous Tokyopop release and original Japanese? Nice. I'll definitely continue to take note of some things. It's important that these releases be consistent globally. Thanks, Mirbirino~ I'd like to try my hand at this some more. It's so funny how these intricate details really snowball into the products being totally different. On surface level, the changes may not seem like much, but they can make or break the experience. To be honest, I was kind of inspired by that blog to do something similar! It's so funny that you mentioned this, because I forgot who was doing these Sailor Moon comparisons and couldn't find the link to them. Thanks for posting that. No prob, there's also these youtube vids comparing the Tokyopop and Kodansha releases of Tokyo Mew Mew. I find these topics really interesting so I'm always hunting them out. Glad you sniffed this one out then. I was considering making a video, but it would have been very time consuming. If you're blogging a directory of comparisons (not strictly Chuang Yi) then you should link us! It's also going to contain my thoughts on Kodansha's Sailor Moon and comparing Dark Horse's Cardcaptor Sakura with Kodansha's bilingual edition. Hope you will tune in.